František Štorm’s Baskerville Original Pro and John Sans, its engendered grotesque, are the subject of this second look through our offerings from the recently included Storm Type Foundry. When a type designer sets out to reproduce the work of another, care must be taken to stay true to the spirit of the original. It’s in this regard most especially where the Štorm revival succeeds. John Baskerville was an English manufacturer, printer, and type designer. His types, several faces of related appearance, designed by Baskerville and cut by John Handy, his punchcutter, have seen plenty of revivals. The Roman represents a first of its kind. The type broke away from the popular English Baroque letter cut by William Caslon, of whom Baskerville was a contemporary. The further rationalized axis and increased stroke contrast, bound by Baskerville’s generous margins and printed on his signature calendared paper served well to brighten the page. It was this effect, taken to a greater degree of severity by the romantics, Bodoni and Didot, that leaves Baskerville’s neoclassical work in a category called by some transitional. Its italic sets densely and demonstrates Baskerville’s understanding of calligraphic form. John Sans has none of the history, but bears the name of its inspiration. In his work on Baskerville Original Pro, Štorm took note of the patterns and “certain constructional elements” that made the face what it is. These were put to work in a grotesque. The result is quite pleasant. John Sans comes in two widths, regular and condensed, eight weights per width. Friday Five: See Ya September! We know you’re busy and the Internet is a crowded place, so we’ll try to give you a little reminder on Fridays of what’s going on out there. Please find below five recent FontShop-related threads that you may have missed. Our monthly picks are up and summarized. Special edition newsletter for our readers this week. Are you going to TYPO London? Theresa’s Tips this week reviews the help section on FontShop.com. We’re excited for the new month to begin. Hope you will be too! Yves posts an in-depth two parter on numerals. The winter semester across Europe starts tomorrow and we wanted to remind students to review the ways to impress their typography teachers and make sure their iPads are pre-loaded with the FontBook app. Additionally, students and non-students alike should stay tuned to this blog, as well as our Twitter and Facebook, throughout the next month for a little something we’re cooking up called Octmobilefest. Also, make sure you’re subscribed to next week’s newsletter for some exciting news from FontShop and FontFont! Have you visited our Help section yet? We’ve filled it with answers to common questions customers have asked in the past. 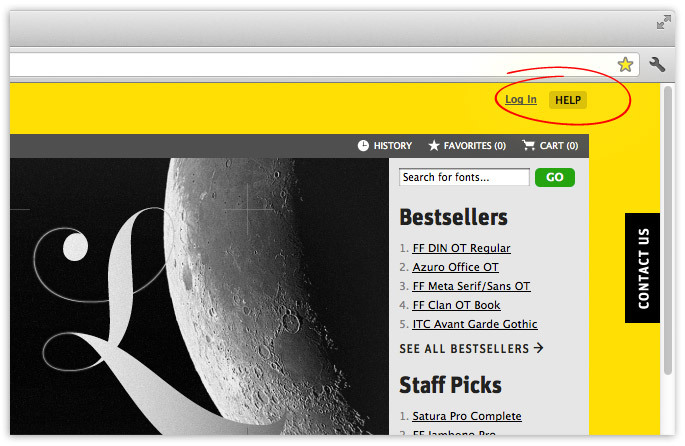 Just click on the HELP link, located on the top right corner of FontShop.com, and you’ll zip on over to the site. When and how will I get my fonts after I buy them? How do I install my fonts? Are all FontShop fonts available for the web? Just visit our Help section if you need a quick answer to your question before you purchase a license or submit a request for topics you’d like for us to go over. Also, the Ultimate Answer to the Ultimate Question of Life, The Universe, and Everything is 42. September Staff Picks are in. “Three-dimensional types are tricky, but beautiful. This one caught my eye when flipping through an old FontShop catalog.” What you’re seeing is four fonts on four layers, each in its own color. See the rest of the September Staff Picks, or check our Staff Picks archive for more. This week’s Theresa’s Tips highlights three areas you should pay attention to before you license a font. Our SF staff share their impressions from the Brand New Conference in San Francisco, while Yves Peters covers ATypI in Iceland. Read ScreenFonts, the monthly review of movie poster typography. Did you miss our latest newsletter on Wednesday? Read it here. Visit the new additions to our foundry list: Storm Type Foundry and Astype. At FontShop we try to keep an eye out for type used well on the web and share the good stuff with our friends. 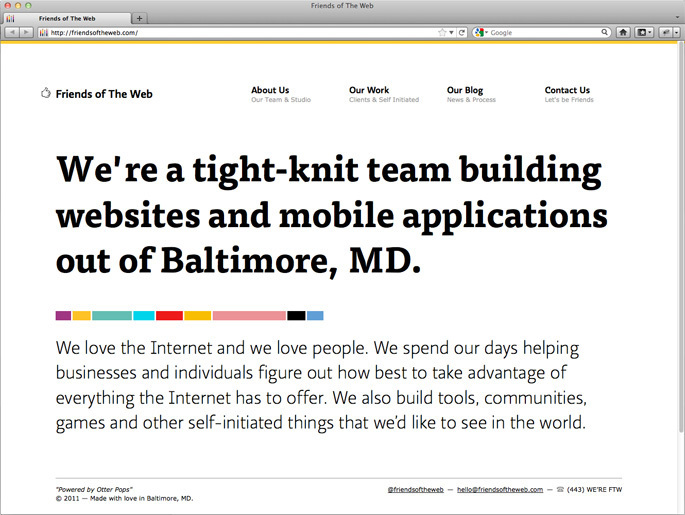 One site Twitter pointed us to recently is Friends of the Web, a Baltimore design firm that works mainly in electronic media. “So much of the web is filled with sites that are cluttered, convoluted, mysterious. We just wanted to be clear about exactly who we are and what we do,” said Andy Mangold who picked up the phone when I called. The message of the site couldn’t be plainer. Set in FF Tisa Web Pro Bold the introductory statements come off genially, and with credibility. Ratio from psType serves as a secondary face to Tisa; both are hosted by Typekit. One of the projects Andy shared with me that’s slated for release within a couple weeks is Quiption, an iPhone App that allows its user to overlay photographs with stylized type and lettering. These images can then be shared over the web—or should the user desire—as real, mailable postcards. 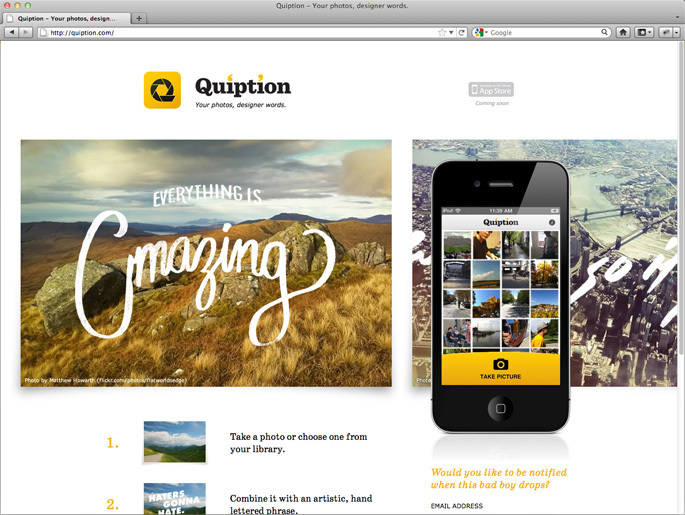 Quiption’s micro-site is set in a less-famous cut of Century Schoolbook. 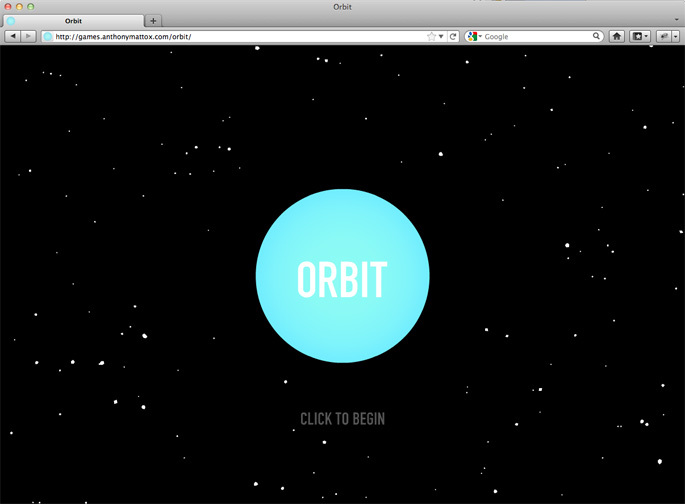 And also presently under development is Orbit, a very simple game that is both mesmerizing and disorienting. Morris Fuller Benton’s Alternate Gothic must of course get some of the credit for this. Before your purchase, pay attention to these three things: Licenses, Your Cart, and Quotes. We will use FF Meta as the example and start with Licenses. End User License Agreements, EULAs for short, are rules to follow when you want to use a font. 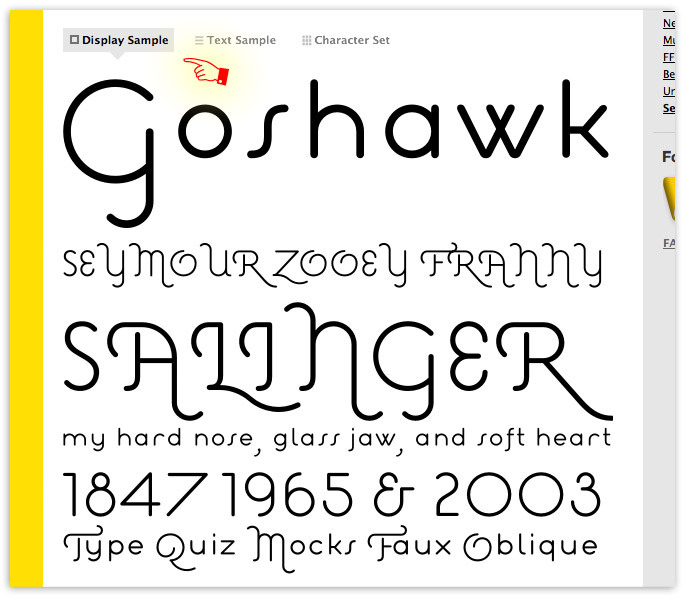 You’ll want to keep in mind that you are not purchasing the typeface itself, but a license to use the font software. Because we have 100+ foundries that have their own EULA and you might not want to read every single one, we added a shortcut to a product’s EULA at the bottom of their page. Your Cart keeps track of the number fonts you’ve added and the subtotal provided is the cost of a basic EULA. The most recent additions to your cart will be shown, up to five, and are linked to the product page. Just hit View Cart to see all the fonts you’ve added. Quotes are easily obtained once you’ve added the items you need to purchase to the cart. Fonts are licensed in blocks of users, you will have to enter the number of computers that you will need to support, and the cart will automatically calculate your subtotal. The default number of users is the cost of a basic EULA. If your company is growing, you can always extend your license to support additional computers by contacting us. We’ll also answer any additional questions you may have before your purchase. Whew! That was a lot to cover. We told you last week that some of our SF staff was heading to the Brand New Conference here in San Francisco, and in case you missed our live tweeting on Friday, here’s a wrap up of our impressions. One great trend: New type and lettering jobs get factored in right up front when budgeting an identity or branding exercise, even on small projects without much of a budget. With this growing emphasis I see a lot more work for type designers and letterers, and with it, higher value being placed on great lettering and type, and design in general. Recognizing this value, Alfredo Burga from the Peruvian branding firm Infinito said of another branding firm’s relocation to Peru (paraphrasing) ‘We welcome the competition. Frankly, it values our services higher.’ How refreshing. I found myself drawn to the speakers who not only shared their work but also shared insights into the process behind their work – long before a final solution begins to take shape. What inspires us? Each speaker brought something interesting to the stage – from Marina Willer‘s quirky (yet brilliant) short films to Infinito’s beautiful presentation that introduced us to the culture, nature, and geography of Peru, context and inspiration seemed to be a theme of the day. Several speakers spoke on ideas about how branding is so much more than just a logo, and it certainly doesn’t have to be set in stone – it can be fluid, it can be allowed to grow. I especially appreciated how Paddy Harrington of Bruce Mau Design spoke about branding in regards to sustainability and holistic thinking. Healthy interactions of all the “parts” produce a whole, and this whole can be designed to inspire positive change. A business and the sum of its parts certainly influence a brand’s voice, but a brand can also play a role in evolving the business itself as well as our communities. What I liked most about the BrandNew conference was how relaxed and casual the atmosphere was. Attendees seemed happy to be there, engaged with each other, and there was a wide variety of enthusiasm for the various presentations. I loved the giant photos in Marina Willer’s presentations and I’m excited to catch her again at TYPO London next month. For those of you wondering what occurred in Iceland at ATypI, Yves Peters has a good wrap up on the FontFeed. Did you attend the Brand New Conference or ATypI? What were your impressions? A reminder of how FontBook for iPad is the perfect tool for typographic reference. 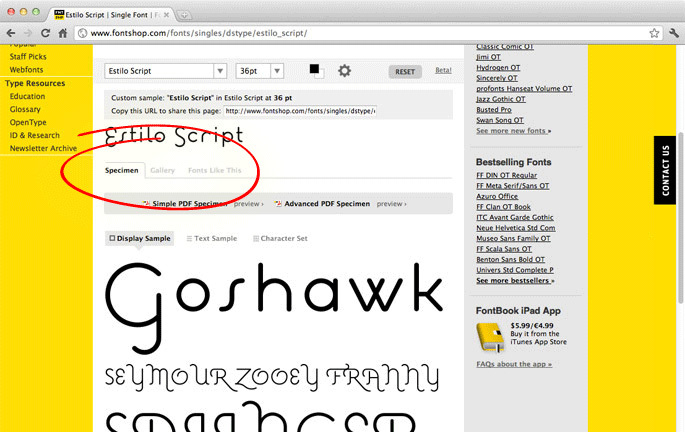 This week, Theresa guides type newbies through the tabs on FontShop. Find Yourself Reykjavik or San Francisco? FontShop is pleased to sponsor two conferences this weekend. Yves Peters covers the graduation of the the Expert Class Type design. Typographic influences on award-winning titles and this month’s crop of ScreenFonts. This is a big weekend for conferences in the type and design worlds. FontShop is proud to sponsor two events on both sides of the pond. For the typophiles who made it to Iceland for ATypI, keep an eye out for the FontFont gang over the rest of the weekend. Those who are heading to San Francisco for Under Consideration’s Brand New Conference can look for the crew from our office here. Make sure to say “hi” at either event. Feel free to leave comments about your experiences below! 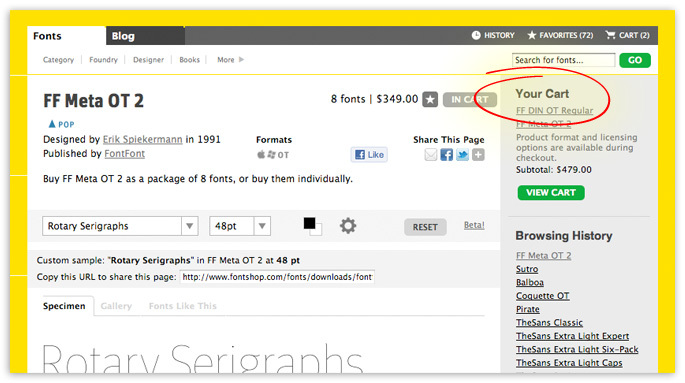 For every product page on FontShop.com you’ll see three tabs: Specimen, Gallery, & Fonts Like This. These tabs are helpful product guides which can inspire potential use. Let me walk you through them using Estilo Script as the example. We’ll start with the Specimen tab. Within the Specimen tab there are three choices: Display Sample, Text Sample, and Character Set. Display Sample will show how your typeface will look at Display sizes. The text is a static, but you can see how the typefaces will behave in larger sizes. 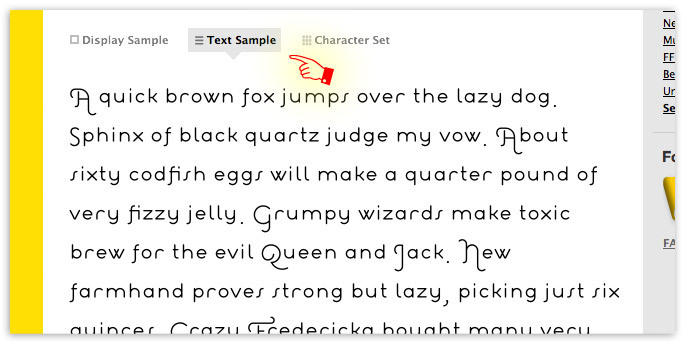 Text Sample will display the typeface in a paragraph. Character Set will show every glyph that is available within the font that you’ve selected. A small arrow within the glyph’s box will appear if there are alternates available for that character. Click the arrow to preview the alternates. Gallery provides real world examples submitted by our customers and staff. Fonts Like This is our hidden gem. Here you’ll find alternate typefaces that have similar qualities. If you ever need an alternate to Helvetica, its just a tab away! 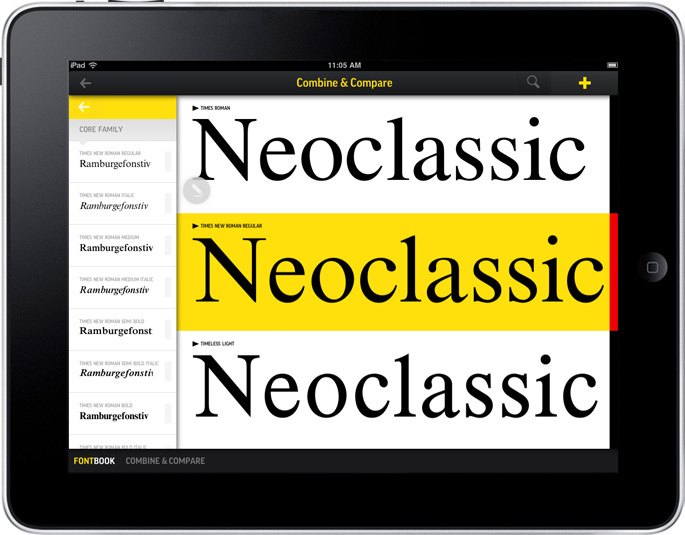 It’s hard to believe that the FontBook app for iPad has been out for almost two months. While we’re glad to imagine all the ways it will be used out in the wild, we’re even more excited to hear them firsthand. Type designer/engineer Dan Reynolds told us the story this morning of how FontBook helped him pin down a few faces for his talk at ATypI. I was in a research library here in Germany, the old Prussian state library in central Berlin. I needed to identify some typefaces in a few reference books from the 1970s, 80s, and 90s. The library was too dark to take clear pictures, and you really aren’t allowed to photograph in there anyway. So I pulled out my iPad, and set a line of text in FontBook, comparing a bunch of different fonts. The three-fonts-at a time Compare screen is my favorite feature in the whole app. I was able to find everything out that I needed (including, for instance, whether one book was set in Linotype Times, Monotype Times New Roman, or Typoart’s Timeless). We’re glad to have helped make it possible. Has the FontBook app helped you find something you’re looking for? If you have a Typekit account, have you updated to the latest Web FontFonts? Also, here’s a refresher from David on webfonts in general. This week’s Theresa’s Tips takes you through the basics of FontShop.com. Impress your typography teacher (and class) this semester. Arguably we had them first. Web FontFonts were the first set of commercially available faces adapted to screen and licensed for web use in the now popular @font-face formats WOFF and EOT lite. Yeah. And, if you don’t want to host the fonts yourself, it’s easier than you think to let our partner Typekit do it for you. And. 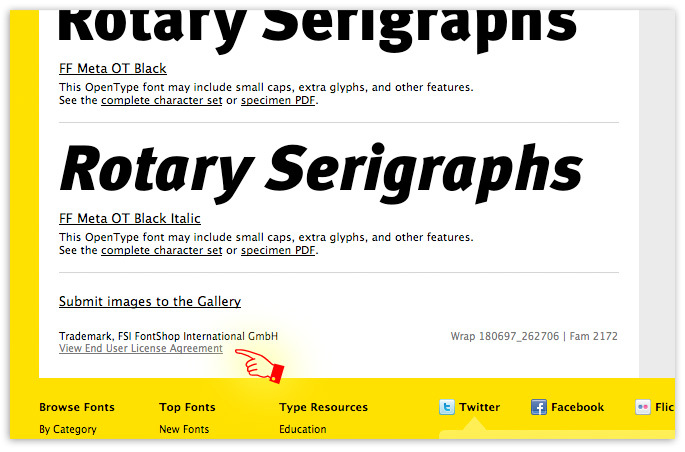 Our Web FontFont license now includes comp fonts for designing in popular programs like Illustrator. For details, download a copy of our current webfont license. Peruse our selection of webfonts here: Web FontFonts.